We Be Reading: "Once upon a time, in a faraway country, there was a woman who lived by herself in the middle of a great forest." "Once upon a time, in a faraway country, there was a woman who lived by herself in the middle of a great forest." The Witch's Boy by Michael Gruber is in a rare set of books for me -- ones that I buy having heard absolutely nothing about them before hand. I happened upon it during an online search and it just caught my eye and was at a very reasonable price. But then, because I didn't know if it would be good or really even what it was about, it languished on my shelves for the last couple of years. 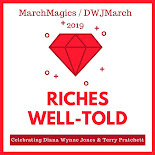 Thankfully, the Once Upon a Time challenge seemed to be a good time to get to it and, in fact, it turned out to be a perfect read for the event. The titular boy is named Lump and he is left as an infant on the doorstep of a witch with a note that reads "The devil's child for the devil's wife". He's ugly and hairy with a piggy nose, stumpy teeth and droopy ears. But the witch suddenly sprouts maternal feelings and decides to raise the boy. She employs a local bear to act as a nursemaid and nanny and has her captive afreet create a nursery for Lump. However, having not spent much time around regular people, she doesn't realize that there is more to raising a child than just providing material needs. And so Lump grows up to be an impetuous and surly child who doesn't appreciate the gravity of many of the rules that his mother has set for him. The result is a rough life for all who cross his path. This story weaves alternate versions of many famous fairy tales into the narrative, including Rapunzel, Little Red Riding Hood, Cinderella and others. It's a very engaging story and the witch is quite an amazing woman. Lump is an awful brat and yet you can't help but feel for him, growing up in such unusual circumstances with a face that only a witch mother could love. I really enjoyed this story and am glad to have taken a chance on it. 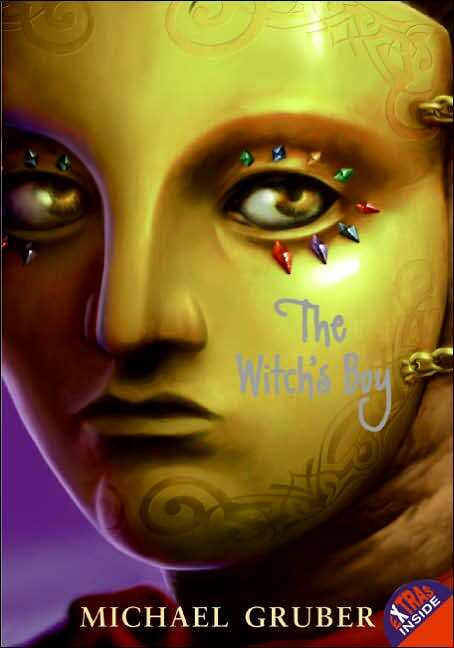 Support our site and buy The Witch's Boy on Amazon or find it at your local library. We bought our own copy. I won't say I will read it because I never seem to have time for reading much other than research. But I certainly will put it on my 'one-day' list. That is one eye-catching cover. Some days I feel like I'm a witch raising a witch's boy. But only on some days. Al - It's quite a unique book and it certainly makes me more interested in Gruber's other books. He's a good storyteller.